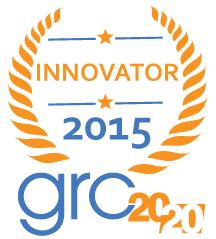 Toronto ON – Resolver Inc., the risk management software provider for over 900 of the world’s largest organizations, has been recognized with a 2015 GRC Innovation Award by GRC analyst firm, GRC 20/20. The annual GRC Innovation Awards recognize technology innovations and user experience in Governance, Risk Management and Compliance programs and processes. Award recipients can be found on the GRC 20/20 blog at: http://www.grc2020.com/index.php/blog. This award recognized innovation found in Resolver’s GRC Cloud and its approach to GRC Programs and Activities. GRC Cloud enables organizations to reduce their documentation, improve navigation through the application and simplify the end user experience. Resolver is the risk backbone for over 900 of the world’s largest organizations, providing software that takes the uncertainty out of risk based decisions. Its integrated platform supports application areas including Decision Making, Internal Control, Internal Audit, Compliance Management, Enterprise Risk Management and Incident Management. Resolver’s team members are experts in all areas related to risk, and support users located across more than 100 countries from offices in North America, United Kingdom, the Middle East, and Australia. GRC 20/20 is the authority in understanding how organizations implement GRC practices that are effective, efficient and agile. Through independent research and industry interaction, GRC 20/20 advises the entire ecosystem of GRC roles within organizations, technology and knowledge solution providers, and professional service firms. Organizations engage GRC 20/20 when they need insight, guidance and advice in dealing with a dizzying array of disruptive issues, challenges, processes, information and technologies, while trying to maintain control of a distributed and dynamic business environment. Visit GRC 20/20 at http://www.grc2020.com/ and follow them on Twitter at @GRCPundit.